The quality of indoor air is not something most people think about, but it can be a problem. This is especially important considering we spend up to 90% of our time inside closed doors. Most people don’t know that the air they breathe in their homes can be up to five times worse than outdoors! The same applies for the quality of air inside your car. Airlabs is a London-based team of atmospheric chemists and airflow engineers from research institutes in the UK and Denmark. Its mission is to reduce people’s exposure to unhealthy air by creating clean air zones in the world’s most polluted cities. This time last year, the company announced Airbubbl, a portable device that creates a bubble of clean air inside your car. 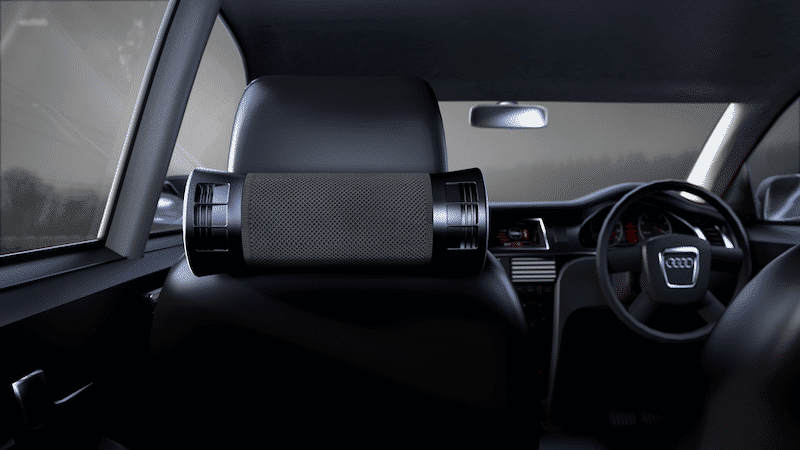 The gizmo removes toxic air pollution that comes through your vehicle’s air inlets, including nitrogen dioxide and other pollution diesel emissions. The device has now been fully developed and is available to buy. To coincide with the release, Airlabs have commissioned some interesting research. This shows that 90% of us do not realize the air inside our car can be more polluted than the air outside. For the average driver or passenger who sits in traffic for an hour each day, the effects of this are equivalent to smoking 180 cigarettes worth of nitrogen dioxide a year! The company says Airbubbl removes more than 95% of NO2within 12 minutes! Its high-grade particle filter also gets rid of toxic gas ozone, VOC’s, fine particulates such as PM2.5 and PM10 and bacteria and odour, protecting you and your family from toxic air pollution. The device fastens behind the front car seat’s headrest and plugs into the car’s cigarette lighter. This has the benefit of directing clean air at head height of the driver and other passengers. Air flow management is controlled via a mobile app that also lets you know the amount of air that has been cleaned. “Whether you are a car commuter, a parent on the school run or someone who drives for a living, unfortunately you currently spend a great deal of time inside your car breathing in dangerous gases and pollutants on a daily basis. And for those with respiratory issues the problem is even more pronounced.” said Marc Ottolini CEO of Airlabs. Airbubbl can be picked up from the manufacturer’s website for £299.99. It’s also available on Amazon (check price) in certain countries.